Schertzer argues that in a diverse federation where the nature of the federal system is contested the courts should facilitate negotiation between conflicting parties, rather than impose their own vision of the federal system. 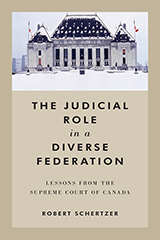 Drawing on a comprehensive review of the Supreme Court federalism jurisprudence between 1980 and 2010, he demonstrates that the court has increasingly adopted this approach of facilitating negotiation by acknowledging the legitimacy of different understandings of the Canadian federation. This book will be required reading both for those interested in Canada’s Supreme Court and for those engaged in broader debates about the use of federalism in multinational states.